EtherBoot @ LinuxWorld Expo San Francisco 2003! Here is a live shot from LinuxWorld. During the show it will be updated every few minutes, and this page will automatically refresh and update every 3 minutes. Enjoy! 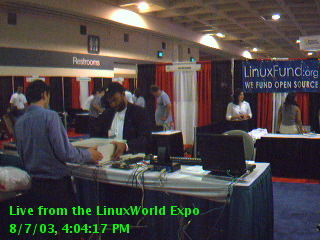 The Etherboot Project secured a .ORG Pavillion booth at LinuxWorld Expo San Francisco 2003. Our goal is to raise the profile of network booting and thin client technology. We demonstrated various aspects of thin client computing, including network booting, creation of ROM images (including demonstrations of ROM-o-matic.net), ROM burning, server configuration, applications of network booting, and many other topics of interest to people at the show. And interest there was! During the exhibition hours we had almost constant traffic at our booth, and were able to meet a lot of people and open a lot of eyes to new possibilities. So what follows is a brief description of our adventure at LinuxWorld, with some pictures.